CJ Liu & Michal Sandler on How to Get Great Things Done Now! Such a beautiful, heart-warming interview with CJ Liu on how to get things done, even when you don’t want to…how to put the systems in place and the kind-gentle-easy-good way to help you overcome your hurdles, your stuck-ness, procrastination, and fears to step forward toward your dreams! That plus my visit to my Fam in Florida, getting my dad on green smoothies, and even getting him to the gym!!! 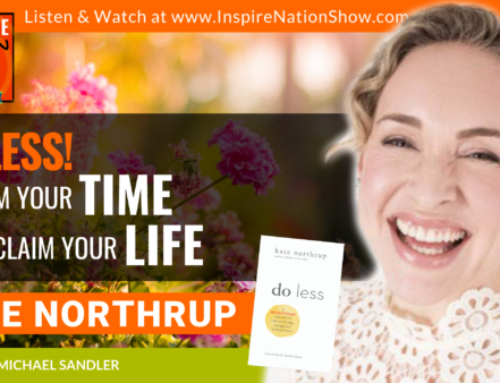 Such a special, heart-warming show, to help you get moving, get things done, and step forward toward your dreams! If you’ve ever wanted to improve or upgrade your life, or simply get ahead, then do we have the Taking Care of Business show for you. Today we’ll talk about how to get moving, get going, and get the things you’ve always wanted or needed to do done. What happened when Michael went to Florida? How Michael did an interview with his parents? How Michael worked to heal himself and his childhood wounds? How Michael got back into his morning routine even when out of town? How to build a powerful healing habit – even with your dad and green smoothies! What “If not now then when” really means? What’s the importance of delegation, or tightening up your timelines? What in the world is Parkinson’s law??? What does it mean to work backwards and come up with a deadline to help you move forward? Why tighter deadlines may be the best way to go! What it means to overcook your goose! What it means to use your environment to support you? What CJ Liu gained from working with Amazon? What is the Amazon sphere? What we learned from “Seven Practices of a Mindful Leader” with Marc Lesser! What Michael needed to do at the dentist and what it has to do with “if not now then when”. What it means to be gentle and loving and kind to yourself when you need to get things done. What it means to stop resisting?